Did you plan a career or just let the wind blow you around? No, I never planned to be a writer. I was slow to even become a reader, being more of a TV addict as a child. But when the urge to write came, it came strongly, and I fell in love with what story can do. It took several years, however, before I had the confidence and the craft to write anything. I started professional life as a playwright and screenwriter, and then progressed to novels, and so my early work taught me the importance of story. I hope this has benefited my novels. If you think of Dickens, Goethe, Shakespeare, Twain, Tolstoy, all were wonderful story-tellers; but a great many modern novelists write as if story were of less importance than style. I do not see a conflict here, and feel rather that those novelists who speak against the story have probably not learned to be good at story-telling. You moved from plays to novels to film – from writer to director, and now producer? What drives that? Rather than a problem, I find switching between these mediums and roles refreshing, rejuvenating. And the lessons I learn in one medium sometimes offer exciting possibilities when transferred to another. Such as using film-editing techniques in a novel, cutting between scenes rapidly as in a movie, or having the narrative effectively reproduce a zoom in to an extreme close up, conveying this in language rather than image. The novel, screenplay and stage play all offer a variety of technical and emotional challenges for the writer. The skills you learn from each are in part transferable between the mediums. Playwriting taught me how much of the action could be contained purely in what is said. My novels, as a result, probably contain a little more dialogue than you normally see. Also, I learned the dramatic importance of making characters speak in a distinctive way that is unique to them. Novelists often overlook this, and have everyone speak more or less the same. This is not true to life. Lastly, a play needs to be built around a strong unifying premise and three questions: what does this character want, how do they try to get it, and what do they actually end up with? I find myself asking the same questions of all my characters in all my stories. Screenplays, on the other hand, are more about action than dialogue and from this you learn how character can also be revealed by what a character does, rather than what they say. So, in my books, an extended section of dialogue may be followed by a purely action-based sequence. I like that contrast, having the reader hear and then only see. Also, film work, for me, is an antidote to the monastic privations of solitary authorship. I like people, enjoy collaboration, and film-making gives me this outlet. Writing a novel is like holding your breath for two or more years. Do you have a Writing Regime? No. I write anywhere anytime. I have just completed a novel written largely in the dining cars of German trains. Did you have a big break? Do you recognize a money idea straight away? Ladies’ Night, a play, was the first break. But I don’t mean by this that Stephen Sinclair (co-author) and I got lucky. I simply mean this was my first big success. The idea behind this play of unemployed guys becoming male strippers was a million dollar idea. Giving the finished form to million dollar ideas is easy. It’s the five dollar ideas that are tough to write. Once I know the story’s objective and its obstacles, I have never so far struggled with how to write a story. Networking and schmoozing are irrelevant. Build it and they will come. Luck is a misleading word. Success comes when preparation meets opportunity. Agents have never been the fountain of opportunity. They prepare and negotiate contracts. Opportunities come from word-of-mouth spreading as a result of the good work you have done. Excellent work is seldom ignored. How come New Zealand has produced so many Oscar winners and even a movie mogul? Perhaps in New Zealand no one can hear you dream – in that we feel so far away from the rest of the world that we tend to make our own fun, and create a culture that is quite “original.” What’s your take on that? NZ is a close knit society, and there is great pressure to be normal. So people tend to hide their inner worlds from each other. NZ literature and films have always explored this. A common theme in New Zealand stories, therefore, has been the intolerance of a small society for any deviation from the “norm.” People are expected to “fit in,” to hide any evidence of disorder, irrationality or madness, and are rejected if they do not. I see strong aspects of this in my own work. Certainly, in my novels The English Harem, Death of a Superhero, In The Absence Of Heroes and Spinners they all have central characters who try to escape their bland realities by retreating into rich inner worlds. I am a New Zealand-born author, and consider it still my homeland. But I am not a nationalistic author, serving my country, revealing who a New Zealander is. I believe that New Zealand is sure enough now of who it is that its writers are free to express themselves on universal themes in an international context. Although I now live in England much of the time, I keep a beach house in New Zealand and go back there at least once a year, to be among my own kind. I first left in my twenties and perhaps there was an element of intellectual frustration in my reasons for doing so. But there was also simple curiosity: as I writer I felt a need to be in conversation with a bigger sample of the human race. You said being nominated for Oscars is like plugging into The Matrix – how so? It’s such a massive download of sensations. I had no idea of what a primary place these awards have in people’s imaginative lives. The positive well-wishes that have been flooding in have taken me very much by surprise. Have you written an acceptance speech? Or another movie to ensure you have a follow-up in the pipeline? I am writing three movie scripts right now: one on Winston Churchill for Working Title, one for George Clooney, and one for Tomas Alfredson. No acceptance speech as I don’t expect to win. When you got the nominations, you said you felt a bit “Sally – You Like Me! You Really Like Me! –Fieldy.” Are you afraid you’ll gush like her? Or perhaps go shy like Anna Paquin? Or own it like Kiwi Pop-Goth Queen of Cool at the Grammys, Lorde? Were I to win, I expect to make a short and unexceptional speech. Perhaps you’d rather your muso hero, Keith Jarrett, just came on and played a song for you? What is it about Jarrett and his performances you love so much? I love how he humps pianos. What is it about the “flying fairy fire fiasco” video that you also passed on – your take on the entertainment industry – that you like so much? Are you afraid of burning out? Getting too close to the flames? I’m old enough to know good times come and good times go. The fairy video is a perfect parable of this. Moral of the story? Enjoy the moment of pure, beautiful flight. How was the film script adaption process? Were the Hawkings involved? In 1988, along with 10 million others, I spent several days trying to decipher, decode, demystify A Brief History Of Time by Professor Stephen Hawking, the world-renowned physicist. Reading is not the same thing as understanding, and the Professor did a fine job of making all 10 million of us feel simultaneously stupid and grateful, blissfully bamboozled, in awe and inept, shunted to the threshold of the incomprehensible to ponder the very very big from a vantage of feeling very very small. What an icon Hawking was – a dramatis persona from writer’s heaven. His theories about time and space had deservedly made him famous, but it was his decade-on-decade outliving of a diagnosis of motor neuron disease (a type of ALS) and his ability to maintain his curiosity and sense of humor that turned him into a hero. In one man here was an unprecedented juxtaposition of extraordinary mental prowess and extraordinary physical incapacity. Back in 1988, when he told us that the universe was far more mysterious than we ever suspected, the world realized it had found a symbol for scientific genius that rivaled Albert Einstein. Someone will make a wonderful movie about this man one day, I mused, never imagining that I would ever have any role to play in this. 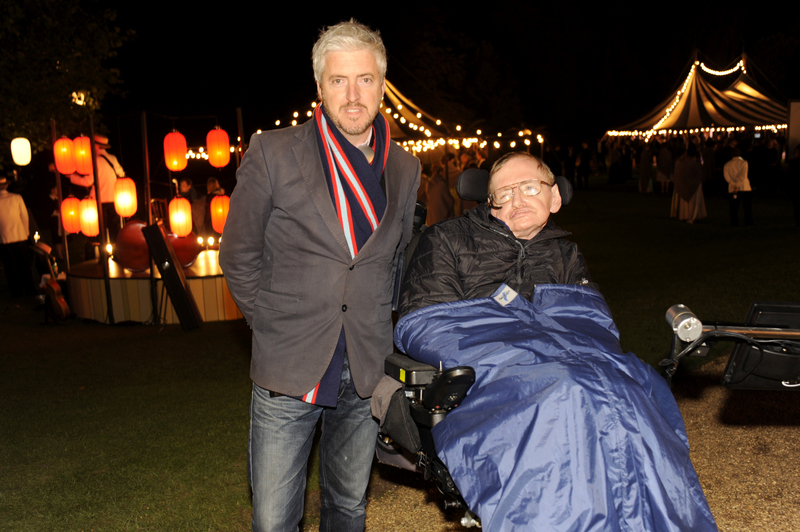 In 2004, I re-entered the Hawking universe from a different angle when I read the autobiography of Stephen’s first wife, Dr. Jane Hawking, Travelling to Infinity. As I turned her pages, the publicly known facts of the icon in the wheelchair faded to reveal a one-of-a-kind love story, the tale of a courageous young woman who fell in love with a young scientist at Cambridge University, only to learn that he had been given only two years to live. Sure, she had the strength to support Stephen during his ordeal, she agreed to marry him, but what transpired was an extraordinary 26 year union in which they explored the love of physics and the physics of love. I was about a third of the way through Jane’s book when I felt an internal ratchet-click and resolved that I must catch the train to Cambridge, home town to both Hawkings, and simply knock on Jane’s door and beg her to let me option the film rights to her book. To my eternal gratitude she let a stranger cross her threshold. She was encouraged enough by what I said that day to allow me to write a script, but added – “Then we shall talk again.” It was clear to both of us that she had stopped far short of granting me the rights I needed. I began to write the screenplay, and it proved a delicate balancing act. It’s a story unified by a single theme – Time – but beneath this were a great many elements all demanding considerable screen time. I knew I wanted balance between Stephen and Jane’s story, for the film to be as much about Jane as Stephen, which is an atypical decision. I wished to serve the love story, which I think has no comparable precedent in cinema given the nature of the specific obstacles Stephen and Jane had to overcome. I wanted to serve the science and Stephen’s long record of astonishing discoveries, making these discoveries graspable to the general public. And, finally, I wanted to tell the horror story of ALS – this brutal disease that takes and takes, until you are either dead or silenced. The years passed. With a draft of the script in hand I knocked on a great many doors but none opened fully. In essence, I was told repeatedly that there was little market for this kind of story. This was partly to do with the assumption that no matter how compelling the central characters or how unprecedented their journey, that physics and the travails of the disease ALS were almost certainly not going to be a recipe for big box office numbers. This calculation, on the part of financiers, was too simplistic and is often not even correct. I was certain that what audiences want, and have always wanted, is an immersive, emotional experience that surprises, delights and even perhaps educates, and this story had those elements in spades. In 2009, I joined forces with producer Lisa Bruce and then, when Jane eventually signed over her book rights in 2012, we snared James Marsh (Man On Wire) to direct. Suddenly, we were moving and moving fast. Eric Fellner, co-head of Britain’s Working Title, responded positively within 11 hours of being sent the script. Eddie Redmayne quickly agreed to play Stephen and Felicity Jones to play Jane. Filming began in Cambridge in October 2013. One particular night of filming stands out in memory. We were staging Stephen and Jane’s first date – a recreation of the 1963 May Ball for Cambridge undergraduates. We had 300 extras in black tie and gowns, two bands, a carnival, and a few thousand quid worth of fireworks ready to erupt in the cold autumn night. And then the Professor arrived – Hawking himself. A staffer was dispatched to halt the Professor beyond the edge of frame. This was narrowly accomplished. “Action!” James called. The music struck up, 150 couples began to waltz, gloved waiters served champagne from silver trays, the bands played soft jazz until the sky suddenly filled with supernovae. It’s like fishing. Wait for a big one. The story will then write itself (almost!). As you develop as a writer, you will become a better judge of what constitutes a truly big fish. Wait for a great idea. When a good one comes, when it seems full of potential, of drama or comedy or both, and which speaks to something universal in our nature, then inspiration comes automatically. David Geary and Anthony McCarten did a creative writing course together in 1983 at Victoria University of Wellington/Te Whare Wananga o te Upoko o te Ika a Maui, New Zealand, under the stewardship of Bill Manhire. David has since been a playwright, actor, screenwriter, filmmaker and educator. David tweets haiku @gearsgeary.